Sometimes it is rather nice to get away to a peaceful and more sophisticated environment without the noise and demands of children. These self-catering locations for just adults also tend to offer a touch of luxury in the form of adults-only holidays with hot tubs, jacuzzi baths, saunas, beautiful interiors and similar more sophisticated niceties. If you are a power shower fan, you may wish to find out more about some of our holiday cottages with a power shower. These are mixed and not necessarily limited to adults only, so do check the details. Click on the photograph for bookings and availability of these adults only lodges. Situated in rural Suffolk, within reach of Thetford Forest for days out and the lovely market town of Bury St Edmunds, these high quality holiday lodges could be perfect for a romantic break for two. Whether for a special occasion or just a short break, these adults-only lodges are child-free so if you don’t have children or want a break away from your little darlings then a stay here could be perfect. Exclusively for adults only, each lodge has been designed to ensure privacy and seclusion. 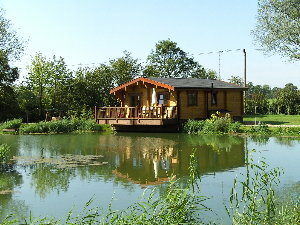 Set next to woodlands and close to one of the owner’s fishing lakes, this is a tranquil and beautiful part of Suffolk. Enjoy staying in a luxurious lodge with a romantic four poster bed and relaxing with your loved one or friend in the outdoor hot tub. Just imagine those romantic nights gazing up at the stars and sitting out hand in hand on your special break. To get your break off to the best of starts your welcome pack here includes complimentary champagne and chocolates. Please click on the photograph of the log cabin above to find out more about these luxury log cabins in a child free zone. 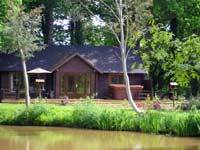 Treat yourself to a luxury romantic break and stay at one of our outstanding one or two bedroom log cabins, situated on the edge of the Wyre Forest. Enjoy the beautiful scenery and wildlife that surrounds you on our exclusive adult only 15 acre site, which leads directly into the forest. We can arrange guided walks in the forest for you, or you can go and explore for yourselves. If you enjoy sport there are local tennis courts available for your use included in the price of your stay. Complementary Champagne and Chocolates await your arrival. Locally, there are fishing pools and excellent golf courses where you will be made most welcome. Or why not book a massage or a beauty treatment with our qualified beauticians. Although we are situated right on the edge of the forest, we are only an hour away from Birmingham’s International Airport, NEC and NIA. The West Midland Safari Park and Bewdley’s Severn Valley Railway are but a short car journey away. The log cabins are well equipped and are furnished to a high standard, including Jacuzzi baths, Dishwashers, Washing machines, DVD players, TV’s and CD players. The kitchen is fully equipped but if you don’t feel like cooking there are plenty of award wining local restaurants, the nearest being a short 2 minute walk down Chapel Lane. Bewdley also has an abundance of take aways and restaurants. The nearest shop and post office is just one mile away in the village of Far Forest. We look forward to seeing you, so just bring yourselves and we will take care of everything else. Click on the photograph to find out more about log cabins to rent for romantic self-catering breaks in a forest setting. Please note that this is an adult only holiday. Something cosy and special, Woodpeckers is a luxury log cabin for couples only and is ideal for honeymoons, anniversaries or romantic breaks. Hot tub on the verandah. Set in 35 acres of landscaped lakes, islands & woodland near Cullompton in East Devon it offers peace and seclusion away from the stresses of modern living. Why not treat your partner to something special? Please click on the photograph for full details of this special country retreat for couples. Lovely cottage for couples. The Corn Loft is an unusual and beautiful hideaway for a couple wishing to get away from it all and explore the Pembrokeshire coast, with its beaches, cliff walks, bird and sea life. Just for 2, the Corn Loft is situated in the picturesque hamlet of Middle Mill - just one mile inland from the popular harbour town of Solva, up the Solva valley. Visit St. David's (3 miles away), southwest Wales and the beauitful Pembrokeshire Coast National Park. Outside, The Corn Loft has its own enclosed garden area with barbecue, as well as access through the Mill's gardens to the river Solva, where you can fish for trout. This captivating Period Lakeland hideaway is a special and romantic self-catering retreat for adult couples and for any special occasion – even honeymoon. 'Olde worldy' character and charm blend so effortlessly with modern 'state of the art' contemporary finish and we think you will agree, Church View is a real Lakeland gem. Appropriately named and overlooking a simply stunning old church, all rooms of the apartment enjoy the fabulous views over rooftops towards our famous mountains. Loughrigg Fell appears to be so close you cannot help but attempt to reach its summit. Tucked away in a gently elevated setting just above the center of this delightful and picturesque village. Yet you could not be handier for the wealth of excellent restaurants, local shops and pubs this enchanting setting has to offer. Walks are in abundance straight from this property and after a hard day on our fells you will be longing to return to the many delights this self-catering hideaway provides. 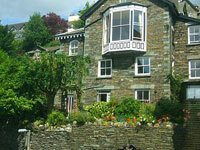 Click on the cottage photograph and book a cottage for a special treat for couples in the Lake District. This charming Cottage is situated in Broom, a small, sleepy village in the heart of the Warwickshire countryside, 7 miles from Stratford-upon-Avon, and just 10 miles from the Cotswolds. It’s a tranquil spot, and a good base for all the main tourist areas of Central England and the Midlands. The cottage is perfect for two people and has been finished to an extremely high standard easily achieving a four star rating by the English Tourist Board. It has a double bedroom with en-suite bathroom, fully equipped kitchen, lounge with dining room, instant combi boiler hot water system and full thermostatically controlled gas central heating for cosy nights in. The village itself has a small river (The Arrow) running through it, two very old half timbered pubs within easy walking distance - both of which serve good value meals all day - highly recommended. It’s only a mile from the River Avon and there’s lots of enjoyable walks close at hand, plus riding stables a few hundred yards away. This couples holiday cottage makes a fabulous base from which to explore the surrounding Warwickshire area. Suggested holiday cottages and log cabins for adults or couples - these include a large number of 1 bedroom cottages, perfect for couples, honeymoons and romantic weekends. Not all are child free.